In 2010, Collins Street Optometrists joined an elite handful of practices in Australia that offer Corneal Refractive Therapy (CRT), more commonly known as Orthokeratology. Five years on, Collins Street Optometrists is now one of the largest orthokeratology practices in Melbourne. Orthokeratology is a non-surgical process that reshapes the cornea by wearing rigid contact lenses while you sleep. When you awaken you can see clearly without glasses or the hassle of wearing contact lenses during the day. Unlike Laser Surgery, the therapy is non-invasive and reversible when treatment is ceased. Orthokeratology enables active people to go about their daily work, recreation, and sports without any interference from glasses or contact lenses, and without the significant costs of invasive surgical correction. Another remarkable aspect of orthokeratology is the evidence emerging that it slows by about 50% the progression of short-sightedness in young eyes. Orthokeratology has been shown to be a viable option for correcting vision as well as slowing the development of myopia in the future. This claim has been reinforced by results in many clinical studies, follow-up studies and retrospective reviews of cases. Click here for more information on myopia control. The first step in orthokeratology treatment is to undergo a normal comprehensive initial consultation. Our normal fee of $92.25 is charged for this 30-40 minute visit and usually attracts a Medicare rebate. This involves establishing your baseline prescription as well as conducting thorough internal and external examinations of the eye to assess the health of structures such as the cornea (the clear tissue at the front of the eye), the eyelids that secrete vital tear oils, and the retina. At the initial visit corneal topography also is performed to very accurately measure in detail the shape of the cornea, which is essential for orthokeratology as the procedure requires frequent "before and after" comparisons of corneal shape and curvature. The fee for performing topography is an additional $46.15, for which there is no rebate from Medicare and usually none from private health insurance. Following these procedures we are in a position to discuss your suitability for orthokeratology and provide alternatives if you are not suitable for this therapy. If the decision is taken to pursue orthokeratology, a diagnostic fitting consultation is scheduled. Here a diagnostic fitting is performed to determine the appropriate corneal lenses/moulds to begin with. Training in how to insert, remove and care for the lenses is also given at this or a subsequent teaching visit. After this the lenses are taken home and worn for an overnight trial. A diagnostic evaluation of the effect of wearing the corneal moulds is performed early in the morning following the first night of wear. In particular another topographical map is taken of the cornea to establish exactly what changes in shape have been brought about by the moulds. If necessary, adjustments are made to the specifications and the treatment moulds are then prescribed and ordered. After delivery of the treatment moulds, the treatment follow-up program consists of reviews at one week, one month, three months and six months, plus any other visits that are required to make further adjustments. It is not unusual for orthokeratology to require more visits than the schedule above. The total consultation fee for those visits related to first-time orthokeratology treatment after the initial visit is $1,215; this also covers any unforseen visits and changes of lenses relating to the treatment. This fee is payable on collection of the corneal moulds. If you are already wearing orthokeratology lenses and need to be re-fitted into a different lens design the consultation fee is $800. Re-fitting into a different lens design may be required if your existing lenses are no longer fitting properly, causing discomfort or not providing you with adequate vision. Re-fitting may also be required if you are new to the practice and needing to replace your lenses, but where we are unable to identify and/or supply the design of lens that you are currently wearing. 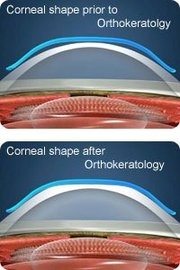 The steps involved in re-fitting to a new lens design include (a) a period of no lens wear, typically 1-2 weeks, to enable the previous correction to "wash out" and establish a new baseline, and (b) essentially the same process and series of follow-up visits as would be required if fitting orthokeratology lenses for the first time. Again this fee covers any unforseen visits and changes of lenses relating to the re-fitting process. Regular routine review visits for orthokeratology are typically performed annually. For these visits the standard initial consultation fee of $92.25 and corneal topography fee of $46.15 will apply. A pair of corneal retaining moulds is provided at the start of the treatment program, the fee for which is $620. If more complex lens designs such as toric or dual axis are required, higher fees may apply. This fee also covers any re-fitting, changes or exchanges of the moulds. For each mould we will provide one free replacement for any breakages in the first month (from the date of our supplier's invoice); after then and within the first six months of treatment we will provide any additional moulds at a discounted price of $200 per mould (toric $225) to cover losses, breakage, or should you wish to have a spare pair. What if Orthokeratology is unsuccessful? Even should the results of your initial consultation suggest that Ortho-K is likely to be successful for you, we cannot guarantee that this will be the case. Ultimately success can only be determined over time and measured against your own expectations and criteria. You are the final judge of whether or not Ortho-K has achieved what you want. The consultation fee of $1,215 is fully refundable regardless of how many consultations have been provided. Because each pair of corneal moulds are ordered individually for each patient they cannot be re-used, so there is no refund of the lens fee of $620 (or more for more complex lenses).